Eco-conscious flower farmer and floral designer Kelly Sullivan of Seattle’s Botanique Flowers arrived with this gorgeous bouquet at a lunch I hosted last week. I had to share it! 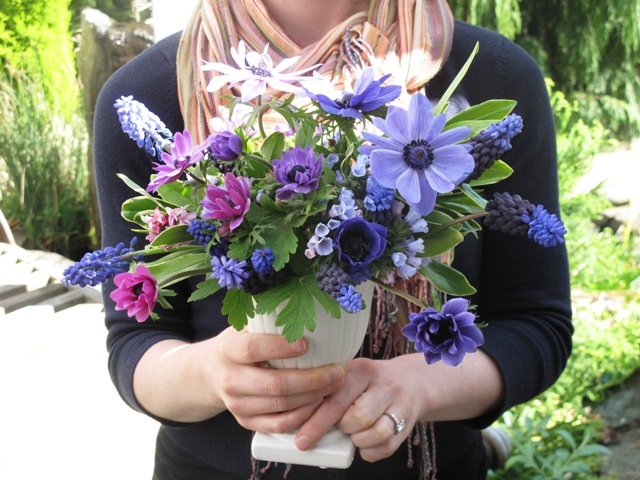 From her own garden: purple-blue grape hyacinths (Muscari); pale pink and purple flowers from a groundcover called Pulmonaria; geranium foliage; and variegated foliage/scented pale-pink flowers from a shrub called Daphne odora. From the garden center: It was too early to harvest these from her own backyard, so Kelly bought potted anemone plants and clipped several of their romantic black-centered flowers in indigo and dark pink to add to the bouquet. Everything is stablized with a small piece of chicken wire inside the vase, which allowed the designer to get the full, cascading effect she wanted. I was smitten! So, when we had a talk and book-signing at Ravenna Gardens on Sunday, I brought along her vase to add to the book display. It’s simply sublime! Kelly's bouquet looks pretty dazzling with our book display. This entry was posted on Tuesday, April 17th, 2012 at 11:44 am	and is filed under Creativity, floral design, Gardening, General, Writing. You can follow any responses to this entry through the RSS 2.0 feed. You can leave a response, or trackback from your own site. Thanks for posting this Debra! It was such a joy to make this arrangement for you, and the lunch was fabulous!!! There is nothing I like more than bringing flowers to someone who truly loves them, and is excited by the local, seasonal, eco-conscious aspects of the design! Kelly Sullivan (Botanique)´s last blog post ..Last Call! 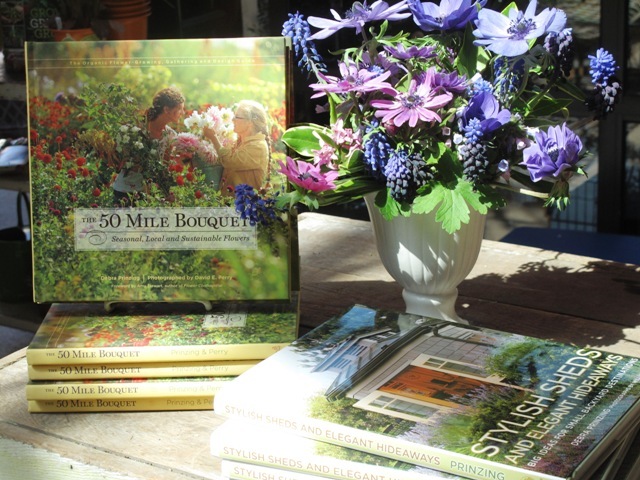 Where can I buy that 50 mile bouquet book? Thanks for sharing the picture here. It’s really colorful and vibrant. I love springs for the beautiful flowers that sprout in the season. These bouquets are very very cute. I love them.